When I took Spencer in for an oral food challenge this month, I was hopeful that he would test negative. In fact, I felt fairly confident that he would. 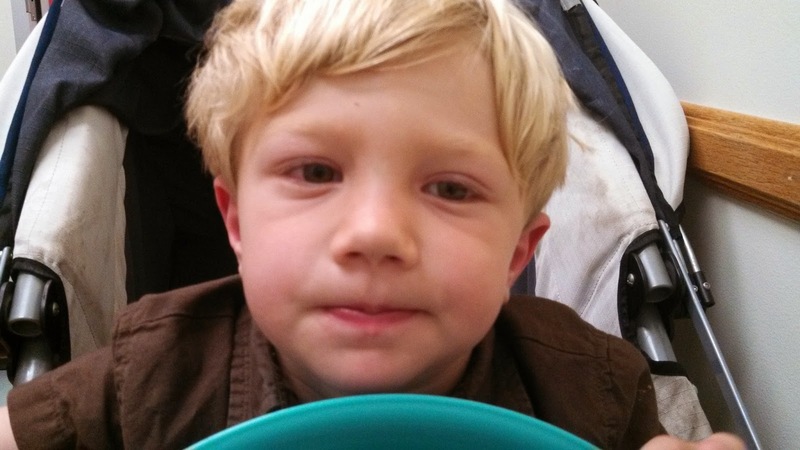 Since he was 1 year old, we have attended yearly appointments with the allergist. Skin tests have been administered for milk, eggs, shellfish, peanuts, etc. He has always tested positive to peanuts, and we have always avoided them. His skin test ranged, but it was generally 20/30 millimeters which is moderately allergic. He has been allergic to milk since first ingesting it at 6 months. But, the peanut reaction was always more severe than the milk. The catch was that he had never eaten peanuts or PB. Top hive is the control, bottom is the peanut. At our latest appointment, he again had a moderate reaction to the skin test. We talked at length about any possible accidental exposure. I relayed a story about me eating a PB granola bar, Spencer and I sharing a water bottle and him developing what I thought was a hive on his lips. I noted it when it happened, but thought it could’ve been a fluke. Before we could do the oral food challenge, the doctor wanted us to get a IgE antibody (RAST) blood test. He also mentioned a new molecular blood test called Uknow peanut. We opted to do both. The Uknow Peanut was $300, but was the latest and greatest in tests. It would not only tell you if your child was allergic to peanuts, but what type of reaction they would have. He ‘passed’ both tests. Which is to say–both tests said he had no response to peanuts. Paydirt! The doc approved the food challenge, and we didn’t hesitate in scheduling for that week. The food challenge is not without risk, of course. And as such, it is conducted in the allergist office, and very tightly monitored over a 3-5 hour time period. I brought a bag of toys and the iPad to entertain him. The very first taste was perhaps an 1/8 of a teaspoon. He reported that it made his tongue itchy. I dismissed it, still in denial that he could be allergic. Every 15 minutes they check and administer another large dose. After finishing the second dose he needed to poo. Nothing abnormal for a 3 year old. Except Spencer usually reserves his poo for at night, in a pull-up. The third dose he gets diarrhea. I am not sure why at this point I can not see what is happening. But, I am still blind to the signs. Jeff has been with us up until now but he needs to leave to get Elliott from school. I tell them to go ahead and head home after pick up and we will meet them later. But, my Mommy intuition is sending out red flags. I felt like asking him to come straight back and to hurry. I felt nervous, very nervous. But, instead, I ignore it. The next dose, he says he might throw up, and starts coughing. My anxiety level is high and all of the red flags have risen. He then falls asleep in the stroller-there is a knot in my stomach. The nurse comments that he cant have an anaphylactic response if he is asleep. I am only slightly relieved by her comment. But also curious–is that true?? It is time for his next does, and when I wake him his eyes are red, swollen half closed and itchy. There is a moment of panic amongst the doctors. I feel like I might throw up, and feel like I am watching the events unfold from above. They start discussing administering the Epi-pen, and I suggest we start with Benadryl. I call Jeff and ask him to hurry back, I think he can hear the panic in my voice. The Benadryl kicked in quickly, thankfully! By the time Jeff arrives at the office-it seems that the danger level had gone down from Red to Orange. But, I was still a bit of a wreck. Spencer on the other hand is up and around, playing and laughing once again. This picture doesn’t capture the severity of his response. But, it shows the swollen eyes and flush face. We spent a total of 4.5 hours in the office. Between the test and the post reaction waiting phase (for up to 4 hours after a food in ingested a reaction can occur) we spent the better part of our days there. The doctors could not explain why he tested negative on both blood tests but positive on the skin test and food challenge. But the conclusion was that he is certainly allergic to peanuts. 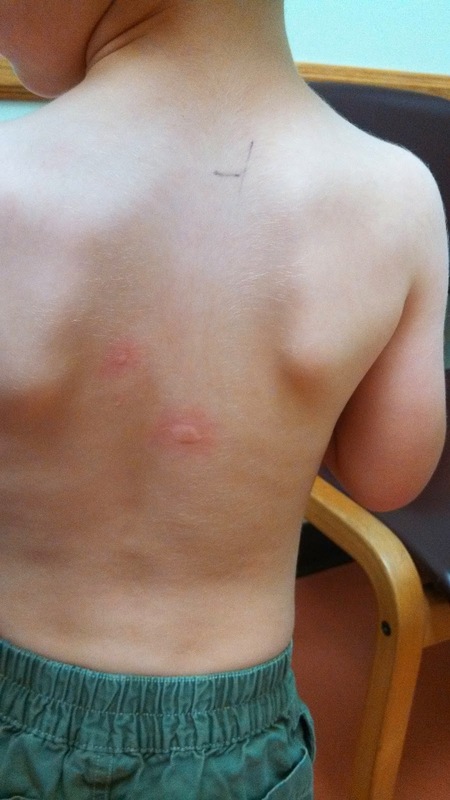 The allergist suggested that he could be allergic to a rare protein in the peanut that the blood tests don’t test for. He wanted to use our case file for research. I am pissed at myself for not listening to my intuition. And for putting him through a traumatic and tragic experience. It was super scary to watch, and heart wrenching when I look back on it. I feel like I have PTSD from the experience, as every time I think back on it I feel anxious and sick to my stomach. I am glad we know that he is in fact allergic so we can ensure he is safe in school and with others. The take home message for me was that he will have a reaction if he ingests peanuts, but it is a slow reaction. Trust my gut. And, science is awesome, but not always 100% conclusive. Always carry Benadryl and the Epi-Pen.